The Patriots have officially placed Gronkowski on the team's reserve/retired list, NESN.com's Zack Cox reports. Agent Drew Rosenhaus said he "wouldn't be shocked" if Gronkowski came out of retirement "to play a few games" at some point, Adam Schefter of ESPN reports. Analysis: Gronkowski has not been shy about discussing retirement, and following yet another Super Bowl win, the all-time great tight end will officially call it a career. He finishes with 521 receptions for 7,861 yards and 79 touchdowns, and he leaves the Patriots with a massive hole in their offense. The team figures to be strong in its pursuit of a tight end this offseason, starting with the 2019 NFL Draft. 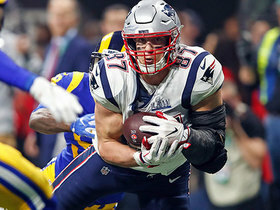 Gronkowski's agent, Drew Rosenhaus, relays that the tight end has yet to decide on his playing future, Kevin Duffy of the Boston Herald reports. Gronkowski's (thigh) agent Drew Rosenhaus expects the tight end to make a decision on retirement within the next couple weeks, Field Yates of ESPN reports. Analysis: Gronkowski presumably hopes to avoid a repeat of last offseason when he waited until late April to confirm his intention of playing in 2018. There have been a few small hints that he's leaning toward playing at least one more season, including his presence at the Patriots' facility in Foxborough to receive treatment for a thigh injury he suffered during the Super Bowl. It sounds like he will announce his decision sometime before the start of the new league year March 13. Gronkowski has made multiple appearances at the Patriots' facility since the Super Bowl, potentially receiving treatment for a thigh injury, ESPN.com's Mike Reiss reports. 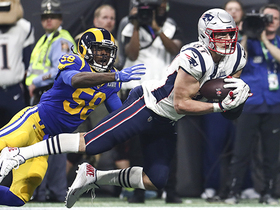 Gronkowski brought in six of seven targets for 87 yards in the Patriots' 13-3 win over the Rams in Super Bowl LIII on Sunday. Gronkowski caught six of 11 targets for 79 yards during Sunday's 37-31 AFC Championship Game overtime win over the Chiefs. Analysis: A week after garnering just one target, Gronkowski led the team in that category while finishing second in receptions and receiving yards. He did little of note outside of a 25-yard gain, but it was still nice to see him so involved in the game plan. While Gronkowski isn't producing as he once did, he's still capable of dictating opposing game plans and serving as a big red-zone target. He'll look to build on this solid effort in the Super Bowl against the Rams. Gronkowksi caught his lone target for 25 yards in Sunday's 41-28 divisional-round win over the Chargers. Analysis: Gronkowski's meager contributions as a receiver don't tell the full story, as he made a number of impactful blocks in the running game to help the Patriots rack up four scores on the ground. You don't get fantasy points for nice blocks, however, so owners who picked up Gronk in playoff pools will be hoping for more tangible production out of the tight end against the Chiefs in the AFC championship game next Sunday. Gronkowski hauled in both of his targets for 24 yards in Sunday's 38-3 win over the Jets. Gronkowski failed to haul in any of his three targets in Sunday's 24-12 win over the Bills. Analysis: Gronkowski looked primed to help out fantasy owners with the stretch run after recording 107 yards and a touchdown in Week 14, but he's mustered just 21 combined yards in two games since. This goose egg is especially disappointing considering Gronk's 69 career catches, 1,070 yards and 12 touchdowns against the Bills coming in all represented his high-water marks against any franchise. He'll be hard to trust against the Jets in Week 17. Gronkowski (ankle/back) was removed from the injury report ahead of the Patriots' Week 16 matchup with the Bills. Analysis: It's an outcome that confirms that the tight end's limitations at practice Thursday were maintenance-related. Gronkowski is thus slated to see his usual heavy allotment of snaps Sunday. Though his numbers this season have been modest by his standards, Gronkowski maintains a solid enough weekly floor to merit continued placement in fantasy lineups. Gronkowski (ankle/back) was limited at Thursday's practice. Analysis: Gronkowski was on the field for all 62 of the Patriots' snaps on offense in Week 15's loss to the Steelers and with no reported setbacks in that contest, we'll assume that his limitations Thursday were maintenance-related. We'll revisit the tight end's status no later than Friday to see if he approaches Sunday's game against the Bills listed as questionable, or free from a Week 16 injury designation altogether. Gronkowski brought in two of five targets for 21 yards in the Patriots' 17-10 loss to the Steelers on Sunday. Gronkowski reeled in all eight of his targets, amassing 107 receiving yards and one touchdown during Sunday's 34-33 loss to Miami. Gronkowski (ankle/back) has been removed from the Patriots' Week 14 injury report, Jim McBride of The Boston Globe reports. Analysis: For the second week in a row, the Patriots' injury list is streamlined by their standards, with just two players (Dwayne Allen and Patrick Chung) listed as limited Thursday. Gronkowski has caught three passes in each of his last four games and has logged just two touchdowns through nine contests overall, but the tight end's high snap count and steady involvement in the Patriots passing game give him a decent weekly fantasy floor, even if he isn't racking up stats as gaudy as past years. Gronkowski (ankle/back) was limited at practice Wednesday, Mike Reiss of ESPN.com reports. Gronkowski caught three of four targets for 26 yards during Sunday's 24-10 win over the Vikings. Gronkowski (ankle/back) doesn't carry an injury designation for Sunday's game against the Vikings, Mike Reiss of ESPN.com reports. Analysis: Gronkowski was on the field for 69 of the Patriots' 70 offensive snaps in the team's Week 12 win over the Jets, so it's not especially surprising that he ended up removed from the team's injury report heading into Sunday. It's assume that the tight end's limitations Thursday were maintenance-related, so he should be on tap for another busy weekend. In his return from a two-game absence last week, Gronkowski finished with three receptions on seven targets for 56 yards and a touchdown. Gronkowski (ankle/back) was limited at practice Thursday, Mike Reiss of ESPN.com reports. Analysis: This is notable since Gronkowski was a full participant Wednesday, but we suspect that the change is the result of managing his practice reps, rather than indicative of a setback. We'll let you know if that ends up being otherwise. Gronkowski isn't listed on the Patriots' Week 13 injury report, Mike Reiss of ESPN.com reports. Analysis: Gronkowski has been an injury report regular of late, but after a Week 11 bye to recuperate, the 29-year-old looked to be in good health while playing 69 of the Patriots' 70 offensive snaps in the team's Week 12 win over the Jets. The fact that he opened Week 13 as a full practice participate suggests he didn't experience any setbacks against New York, making him an easy player to slot into fantasy lineups. Another healthy workload awaits Gronkowski in Sunday's game against the Vikings. Gronkowski (back/ankle) caught three of seven targets for 56 yards and a touchdown in Sunday's 27-13 win over the Jets. Analysis: Gronkowski looked effective in his first game action since Oct. 29, hauling in a 34-yard touchdown late in the first quarter. His seven targets led the team, but Gronk finished third behind wide receivers Julian Edelman and Josh Gordon in catches and yards. The oft-injured tight end is still a strong fantasy play when he's able to suit up, so deploy him if he's playing in Week 13 against the Vikings. Gronkowski (back/ankle) is listed as active for Sunday's game against the Jets. Analysis: Gronkowski, who last suited up Oct. 29 against the Bills, is back Sunday as expected, no doubt aided by the added healing time he was afforded by the Patriots' Week 11 bye. His only TD through seven games played to date happened all the way back in Week 1, but so long as the star tight end avoids any setbacks, he's a candidate to garner some red-zone looks from QB Tom Brady (knee/illness) in Week 12. Though Gronkowski (back/ankle) is listed as questionable for Sunday's game against the Jets, he plans to play this weekend, Mike Reiss of ESPN.com reports. "Definitely ready to get back there. I'm good to go," Gronkowski relayed Friday after practice. "I'm excited to be back out there with the team, and excited to get back out there on Sundays and play some ball." Analysis: Gronkowski , who was aided by added healing time afforded by the Patriots' Week 11 bye, leaves little doubt that he's on track to suit up this weekend. That said, given his official injury designation, it will still be worth confirming his status in advance of Sunday's 1 p.m. EST kickoff. Gronkowski (back/ankle) was listed as limited at Wednesday's practice. Analysis: Per Adam Schefter of ESPN, Gronkowski -- who has missed three of the Patriots' past four games -- is expected back Sunday against the Jets, following his team's Week 11 bye. That's not to be taken for granted of course, but it's expected that Gronkowski will receive clearance to handle a full snap load -- barring any setbacks in practices Thursday or Friday -- ahead of Sunday's 1 p.m. EST kickoff. Gronkowski (back/ankle) is expected to be available for the Patriots' next game Nov. 25 against the Jets, sources told Adam Schefter of ESPN. Gronkowski (ankle/back) was present for Wednesday's practice, Zack Cox of NESN.com reports. Analysis: Wednesday's practice is the only session of the week for the Patriots, who are on bye. Gronkowski, who last suited up in Week 8, will thus target a return to action Nov. 25 against the Jets. Added clarity on his status for that contest should arrive when the team reconvenes next week. Gronkowski (back/ankle) is inactive for Sunday's game against Tennessee, Mike Reiss of ESPN.com reports. Analysis: With the Patriots on bye in Week 11, the team has added incentive to hold out Gronkowski for another game to give him ample time to recover from the back and ankle issues. Dwayne Allen will likely start at tight end, but he doesn't project to have much of a role in New England's passing attack. Gronkowski (back/ankle) traveled with the Patriots to Nashville ahead of Sunday's game against the Titans, Mike Reiss of ESPN.com reports. However, there's no indication that it's a sign Gronkowski will play in Week 10. Gronkowski (back/ankle) is listed as questionable for Sunday's game against the Titans but isn't expected to play, Kevin Duffy of the Boston Herald reports. Analysis: The team has yet to make an official announcement, but it appears the Patriots want to be cautious with their star tight end, particularly with a Week 11 bye in mind. If Gronkowski is ruled out for another week, look for Dwayne Allen to start at the position. Allen has done little with his extended opportunities in Gronkowski's stead, catching just one pass in the last three weeks despite playing over 50 snaps in two of those contests. Gronkowski (back/ankle) is listed as questionable for Sunday's game against the Titans after practicing in a limited fashion all week, Ben Volin of The Boston Globe reports. Gronkowski (back/ankle) logged a limited practice Thursday, Mike Reiss of ESPN.com reports. Gronkowski (back/ankle) was listed as limited at Wednesday's walk-through practice, Mike Reiss of ESPN.com reports. Analysis: Once the Patriots practice with pads, added context will arrive with regard to Gronkowski's status for Sunday's game against the Titans. With a Week 11 bye on the horizon, it possible that the team might consider erring on the side of caution with Gronkowski this weekend. Should Gronkowski end up being a game-time decision for the contest, fantasy owners will fortunately have more options to turn to if he's ultimately inactive, as New England and Tennessee kick off at 1 p.m. EST. Gronkowski (back/ankle) was present for Wednesday's walk-through practice, Mike Reiss of ESPN.com reports. The Patriots are viewing Gronkowski (back/ankle) as week-to-week after his injuries left him unavailable in Sunday's 31-17 win over the Packers, Adam Schefter of ESPN reports. Gronkowski (back/ankle) is inactive for Sunday night's game against the Packers. Analysis: With both Gronkowski and Jacob Hollister (hamstring) out Sunday night, Dwayne Allen will handle the team's tight end duties. His profile in the Patriots' passing game doesn't figure to be big though, with Gronkowski's targets likely to be largely absorbed by the team's wideout corps. Gronkowski (back/ankle) will go through a pregame warmup Sunday before his status is decided for the Patriots' game against the Packers, but the team is concerned about his availability, Adam Schefter of ESPN reports. Gronkowski (back/ankle) is listed as questionable for Sunday's game against the Packers, Mike Reiss of ESPN.com reports. Analysis: Gronkowski was held out of Thursday's practice after being listed as limited in Wednesday's walk-through, so his return to the field Friday -- albeit in a limited fashion -- bodes well for his chances of being ready for Sunday's 8:20 p.m. EST kickoff. Look for added clarity on his Week 9 status to arrive before the first wave of games this weekend. Gronkowski (back/ankle) was present for practice Friday, Jim McBride of The Boston Globe reports. Analysis: Gronkowski was held out of Thursday's session after being listed as limited in Wednesday's walk-through, so his return to the field Friday is a good sign. An update on the extent of his involvement in practice will come later Friday, but the tight end is trending toward a questionable designation for Sunday's game against the Packers. Gronkowski (back/ankle) is expected to practice Friday, Michael Giardi of NFL Network reports. Analysis: Gronkowski sat out practice Thursday after getting in a limited session the day before, so it's a good sign that he'll likely be able to put in some work Friday. The Patriots will reveal Gronkowski's status for Sunday's matchup with the Packers after their final practice of the week comes to a close. Gronkowski (ankle/back) was not spotted at Thursday's practice, Jim McBride of The Boston Globe reports. Analysis: Gronkowski was listed as a limited participant at Wednesday's walk-through, so his absence from practice Thursday is notable. It's possible, however, that the tight end is simply undergoing treatment with an eye toward a return to practice Friday. 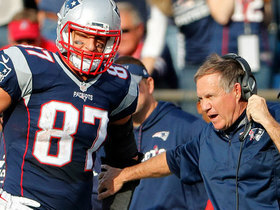 Gronkowski (back/ankle) was listed as limited during Wednesday's walk-through practice, Doug Kyed of NESN.com reports. Analysis: Gronkowski was on the field for 68 of the Patriots' 76 offensive snaps in Monday's 25-6 win over the Bills and after coming out of the contest with no reported setbacks, it's assume that the tight end's listed limitations were maintenance-related. He should be ready to play by the time Sunday's game against the Packers arrives. Gronkowski caught three of eight targets for 43 yards in Monday night's 25-6 win over the Bills. Analysis: Gronkowski returned to the fold after missing Week 7 due to back spasms. Although his presence offered a lift to New England's offensive options, Gronk struggled to get much going, with a 22-yard reception highlighting his night. The All-Pro will hope Week 9's meeting with the Packers will produce an improved performance. Gronkowski (back/ankle) is listed as active for Monday night's game against the Bills. Analysis: Gronkowski, who missed Week 7's game against the Bears with back spasms, was able to practice in a limited fashion this past week, so it's not a surprise that he's active. Assuming no in-game setbacks, he figures to handle his normal (significant) workload. In his last game (on Oct. 14), Gronkowski hauled in three of his four targets for 97 yards. Gronkowski (back) is listed as questionable for Monday's game against the Bills, but it's expected the tight end will be available to play, Ian Rapoport of NFL Network reports. Although he is listed as questionable, Gronkowski (back/ankle) stated he intends to take the field Monday against the Bills, Doug Kyed of NESN.com reports. Analysis: Gronkowski made his intentions known following Saturday's practice. Still, the final call is up to the Patriots, as they could ultimately opt to err on the side of caution with their star tight end, especially given their lackluster opponent. He sat out unexpectedly last week after his back acted up, and after three back surgeries in his playing career, it is a sensitive issue. Gronkowski (back/ankle) was listed as a limited practice participant once again Friday. Analysis: Gronkowski, who missed this past Sunday's game against the Bears with back spasms, appears to be trending toward suiting up for Monday night's 8:15 ET tilt against the Bills, barring any setbacks. That said, the tight end is likely to end up being listed as questionable for the contest, so ideally added clarity with regard to his Week 8 status will arrive before the first wave of games this weekend. Gronkowski (back/ankle) was officially a limited practice participant Thursday. Gronkowski (back) returned to practice Thursday, Mike Reiss of ESPN.com reports. Analysis: Per the report, the tight end -- who missed Week 7's win over the Bears due to back spasms -- was encouragingly able to "align in a three-point stance and then thrust up against a teammate holding a blocking pad." Look for Gronkowski to be officially listed as a limited practice participant Thursday, but at this stage he's trending in a positive direction as Monday night's game against the Bills approaches. Gronkowski (back) has "a shot" to play in Monday's game against the Bills, a league source told Jim McBride of The Boston Globe. Gronkowski (back) wasn't present for practice Wednesday, Mike Reiss of ESPN.com reports. Analysis: The Patriots play Monday against the Bills, so the team's first official injury report of the week won't arrive until Thursday. There's hope that the tight end will quickly move past the back spasms that sidelined him in the Week 7 win over the Bears, but a return to practice in any capacity would no doubt help soothe the concerns of those hoping to use Gronkowski this week. Gronkowski, who missed Sunday's 38-31 win over the Bears, "suffered from painful back spasms" during Friday's practice, Michael Giardi of NFL Network reports. Analysis: According to Giardi, Gronkowski's injury is believed to be "a short-term thing," but given that the tight end has previously required three back surgeries, his situation still bears monitoring closely. Gronkowski will at least benefit from an additional day off to recuperate with the Patriots taking on the Bills on Monday night in Week 8. The Patriots downgraded Gronkowski (ankle/back) from doubtful to out for Sunday's game against the Bears. Gronkowski is not expected to play Sunday due to a back injury, acording to Ian Rapoport, but the injury isn't believed to be serious, and Gronkowski could be back soon. 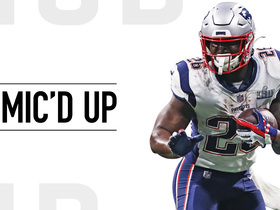 Analysis: Whenever Rapoport cites unnamed sources you should take the report with a grain of salt, but if we take this at face value Gronkowski could be back next week. Moreover, he hasn't yet been officially ruled out for this week, but it's not looking good. Gronkowski, who is listed as doubtful for Sunday's game against Chicago due to ankle and back injuries, is expected to play Week 8 at Buffalo, Adam Schefer of ESPN reports. Gronkowski (ankle/back) was downgraded to doubtful for Sunday's game against the Bears. Analysis: Gronkowksi didn't travel with the team to Chicago, but the Patriots are apparently still holding out some hope for their star tight end since they have yet to rule him out. Fellow tight end Jacob Hollister (hamstring) was downgraded to out, likely leaving Dwayne Allen as the team's lone pure tight end for Sunday. Gronkowski (ankle/back) is "highly unlikely" to play Sunday after not traveling with the team to Chicago, Adam Schefter of ESPN reports. Analysis: Gronkowski is still officially considered questionable as he deals with back and ankle issues, but at this point he is certainly trending in the wrong direction. Schefter also reports the Patriots are unwilling to rule out their star tight end until seeing how he feels on game day, but fantasy owners should have a contingency plan ready to go for Sunday's early slate of games. Gronkowski (ankle/back) is listed as questionable for Sunday's game against the Bears. Analysis: The ankle injury isn't a new concern for Gronkowski, but his addition of the back issue on the Patriots' injury report makes his status worth monitoring in advance of Sunday's 1 p.m. EDT kickoff. Despite regular appearances on the injury report, Gronkowski has yet to miss a game this season and has turned in 26 receptions for 405 yards and a touchdown across six games. Gronkowski (ankle) remained limited at practice Thursday. Analysis: We doubt that Gronkowski's Week 7 status is in any peril, but the Patriots could still choose to officially list the tight end as questionable for Sunday's 1:00 ET kickoff against the Bears. Gronkowski (ankle) was limited at practice Wednesday. Analysis: The tight end has been managing an ankle issue of late, but he was on the field for all but one of the Patriots' 78 offensive snaps in their in 43-40 win over the Chiefs in Week 6. That ample workload seemingly implies his limitations Wednesday were simply maintenance-related. Gronkowski caught three passes (four targets) for 97 yards in Sunday's 43-40 victory over the Chiefs. Gronkowski (ankle) is listed as active for Sunday night's game against the Chiefs. Analysis: Gronkowski, who was also listed as questionable in Week 5, ended up logging 63 of 69 snaps on offense in the Patriots' 38-24 win over the Colts on Oct. 4, en route to catching six passes for 75 yards. Through five games, the team's star tight end has hauled in 23 of his 31 targets for 308 yards and a TD. Gronkowski (ankle), who is listed as questionable for Sunday's game against the Chiefs, is expected to play, Ian Rapoport of NFL Network reports. Analysis: Despite his injury designation, Gronkowski never seemed at much risk of sitting out Week 6 after practicing in limited fashion Wednesday through Friday. Rapoport's report should give fantasy owners some added peace of mind in keeping Gronkowski active, as the first two waves of Sunday games will have already concluded when the Patriots and Chiefs kick off at 8:20 p.m. EDT. Gronkowski (ankle) is listed as questionable for Sunday night's game against the Chiefs after practicing in a limited fashion all week. Analysis: We'd be very surprised if Gronkowski isn't in uniform Sunday night, but hopefully added optimism on that front will arrive via the likes of NFL insiders Adam Schefter and Ian Rapoport closer to game time. Gronkowski, who was also listed as questionable Week 5, ended up seeing action on 63 of 69 snaps on offense in the Patriots' 38-24 win over the Colts on Oct. 4. Gronkowski (ankle) was limited at practice Wednesday, Mike Reiss of ESPN.com reports. Analysis: Gronkowski played through the same ankle issue last Thursday against the Colts, logging 63 offensive snaps and finishing with six receptions for 75 yards on seven targets. With no reported setbacks coming out of that contest, it's assumed that the Patriots are simply dialing down his practice reps in advance of the Week 6 game against the Chiefs. Gronkowski (ankle) brought in six of seven targets for 75 yards in the Patriots' 38-24 win over the Colts on Thursday. Analysis: Gronk looked to be back to normal after a pair of lackluster weeks, and he didn't seem to be affected much by the ankle injury he'd battled throughout the week. The perennial Pro Bowler was second in receiving yards to James White, and his 75-yard tally was his highest since a 123-yard effort against the Texans in the opener. He'll look to utilize the 10-day break before a Week 6 battle against the Chiefs to further rest his ankle for what could be an offensive shootout. Gronkowski (ankle) is listed as active for Thursday night's game against the Colts. Gronkowski (ankle) is expected to suit up Thursday against the Colts, Adam Schefter of ESPN reports. Gronkowski (ankle) is listed as questionable for Thursday's game against the Colts. Analysis: Gronkowski was also a limited participant on Wednesday's injury report. For now, he should be treated as a game-time decision for Thursday's contest, so those looking to utilize the tight end in Week 5 lineups will want to monitor his status closely leading up to the 8:20 p.m. EDT kickoff. Dwayne Allen would be the next man up on the depth chart if Gronkowski is forced to sit out, though Allen doesn't project as much of a factor in the passing game. Gronkowski (ankle) did not participate in Tuesday's walkthrough. Analysis: As expected, Gronkowski was listed as a non-participant after he wasn't spotted during the portion open to the media. There doesn't appear to be much concern surrounding Gronkowski's health, but the tight end being absent for two straight days isn't an encouraging sign on a short week. Gronkowski looks to be trending toward being a game-time call against the Colts, but more information likely will be revealed following Wednesday's practice. Gronkowski (ankle) wasn't present at the portion of Tuesday's walk-through practice open to the media, Mike Reiss of ESPN.com reports. Analysis: Gronkowski seems destined to be listed as a non-participant on the second consecutive injury report, which the Patriots will release Tuesday afternoon. An ankle injury is to blame, but it's not believed to be a serious concern, per Adam Schefter of ESPN. No matter how he appears on the final Week 5 injury report Wednesday, Gronkowski could be in line for a game-time decision Thursday against the Colts. The Patriots' estimated practice report Monday lists Gronkowski (ankle) as a non-participant, Mike Reiss of ESPN.com reports. Analysis: ESPN.com previously relayed via Adam Schefter that the ankle injury, which prevented Gronkowski from finishing Sunday's 38-7 win over the Dolphins, is not considered serious. That said, it's likely that the tight end will draw a "questionable" injury designation for Thursday 8:20 PM ET kickoff against the Colts and quite possibly end up being viewed as a game-time decision for that contest. The ankle injury that prevented Gronkowski from finishing Sunday's game against the Dolphins is not considered serious, Adam Schefter of ESPN reports. Analysis: It's great news for those invested in the Patriots' star tight end. That said, Gronkowski could still end up listed as questionable for Thursday's game against the Colts, making his Week 5 status worth monitoring closely. The Patriots approach Week 5 with a banged up tight end corps, with Gronkowski dealing with an ankle injury and Jacob Hollister bothered by a chest issue. Analysis: That currently leaves Dwayne Allen as the team's healthiest tight end, and it will be worth watching the Patriots' roster moves in the coming days. The team plays again Thursday against the Colts, and if Gronkowski's injury is one that could cause him to miss any time, the team figures to added depth at the tight end position. Gronkowski, who left Sunday's 38-7 win over the Dolphins with an ankle injury, per Mike Reiss of ESPN.com, finished the contest with four catches on seven targets for 44 yards. Analysis: Following his exit, Gronkowski spent the remainder of the contest in the Patriots' locker room. Given the game context, that could have been precautionary, but the tight end's status will be worth tracking closely, especially with the Patriots' next game coming in four days against the Colts on Thursday night. Gronkowski suffered a right ankle injury during Sunday's game against the Dolphins and is questionable to return. Analysis: Gronkowski was limited in practice in Week 4 due to an ankle injury, and this appears to be related. The injury woes continue to haunt him, and Dwayne Allen is the lone healthy tight end if he can't return. Gronkowski (ankle) is listed as active for Sunday's game against the Dolphins. Gronkowski (ankle), who is listed as questionable for Sunday's game against the Dolphins, is expected to play, Adam Schefter of ESPN reports. Gronkowski (ankle) is one of 11 players listed as questionable by the Patriots for Sunday's game against the Dolphins, Mike Reiss of ESPN.com reports. Analysis: We'd be very surprised if Gronkowski wasn't available Sunday after he practiced in a limited fashion this past week. Official confirmation of his Week 4 status will arrive in advance of the first wave of games this weekend, with the Patriots kicking off at 1:00 PM ET. Gronkowski caught four of five targets for 51 yards during Sunday's 26-10 loss to the Lions. Analysis: Gronkowski's stat line was betrayed by the general inability of the Patriots offense to stay on the field. The fact his five targets led all New England receivers goes to show just how little passing volume there was to go around. Considering the tight end averaged 7.5 looks per game in 2017, expect Gronkowski's workload to return to elite levels sooner than later. Next up is a Week 4 date with a Dolphins defense that has yet to allow a touchdown to a tight end in 2018. Gronkowski (ankle) does not carry an injury designation for Sunday night's game against the Lions. Analysis: Gronkowski, who practiced fully Friday, is thus good to go and set to log his normal heavy allotment of snaps Sunday night. He hauled in just two of four targets for 15 yards against a rugged Jaguars defense last Sunday, but he's a prime bounce-back candidate Week 3, especially with Jacob Hollister (three catches for 25 yards last weekend) having been ruled out due to a chest injury. Gronkowski (ankle) was "moving well" at Friday's practice, Mike Reiss of ESPN.com reports. Analysis: This nugget supports the notion previously put forth by Ian Rapoport of NFL Network that the tight end's ankle injury is not believed to be concerning. We'll have to see how the Patriots officially list Gronkowski for Sunday night's game against the Lions, but at this point we'd expect him to be available for the contest. Gronkowski was added to the Patriots' Week 3 injury report after being limited by an ankle injury Thursday, Mike Reiss of ESPN.com reports. Analysis: Historically, Gronkowski is no stranger to the injury report, so his level of practice participation Friday will be telling. It remains to be seen if his limitations Thursday were the result of an in-practice tweak, or are indicative of the tight end managing a minor injury issue. Gronkowksi was limited to two catches for 15 yards on four targets in Sunday's 31-20 loss to the Jaguars. Analysis: Jacksonville's defense backed up cornerback Jalen Ramsey's pregame trash talk, as Gronkowski was basically a non-factor. Luckily for Gronk, most defenses don't have a plethora of well above-average players to help make his life difficult, so this poor performance will likely be an outlier. Expect the tight end to get back on track Sunday night in Detroit. Analysis: Any questions about his future in New England were put to rest during the Patriots' first drive, which was capped off with a 21-yard touchdown strike up the left sideline to Gronkowski. Gronkowski and Brady ultimately hooked up on multliple occasions downfield over the course of the contest, cementing his status as the Patriots' toughest matchup at receiver, particularly while Julian Edelman serves a season-opening four-game suspension. The Patriots have re-worked Gronkowski's 2018 contract by adding $1 million in per-game bonuses to it, as well as $3.3 million in incentives, Adam Schefter of ESPN reports. Gronkowski was on the field for 16 snaps in Friday's preseason loss to the Panthers. Analysis: Gronkowski didn't haul in his only target in the contest, but he made it through what is assuredly his only preseason action intact, and is poised to remain a vital component in the Patriots' passing game this season. With Brandin Cooks no longer in the mix and Julian Edelman set to serve a four-game suspension to start the looming campaign, look for QB Tom Brady to lean heavily on Gronkowski and wideout Chris Hogan out of the gate. Gronkowski is expected to play in Friday's preseason game against the Panthers, Jeff Howe of The Athletic Boston reports. Analysis: It remains to be seen what kind of workload he'll see while working with QB Tom Brady and the Patriots' other healthy starters Friday, so Gronkowski isn't necessarily the preseason lineup lock that he'll become once the regular season rolls around. Gronkowski seems unlikely to play Thursday night against the Eagles, Doug Kyed of NESN.com reports. Analysis: There's not much to gain by exposing Gronkowski to unnecessary contact at this stage, so if he ends up seeing any exhibition action, it's not likely to be extensive. That reality saps the tight end's DFS appeal in preseason formats, but helps ensure that he's healthy when the games count. Gronkowski was one of several key players the Patriots chose to rest in their preseason opener this past Thursday, Mike Reiss of ESPN.comreports. Analysis: The Patriots have little to gain by exposing Gronkowski to unnecessary contact during the preseason. If he ends up seeing any exhibition action, look for it to be minimal. The star tight end is thus not worthy of preseason DFS lineup consideration. Come Week 1, however, Gronkowski will remain a fantasy lineup lock as long as he can stay healthy. As expected, Gronkowski was present for the start of training camp, NESN.com reports. Gronkowski is expected to report to training camp July 25, Adam Schefter of ESPN reports. Gronkowski participated in Tuesday's mandatory minicamp practice, the Patriots' official site reports. Gronkowski confirmed Sunday that he will attend mandatory minicamp, ESPN reports. "We've got mandatory minicamp this week. So I'll be there this week," Gronkowski said. "I'll be full go. I'm looking forward to it. Can't wait to get back to work. I'm excited." Analysis: Gronkowski wasn't present for the team's OTAs earlier this offseason and is also working towards a new contract with the Patriots, though it doesn't appear any of that will impact his availability for minicamp. That means Gronkowski will rejoin the team in the near future and should immediately jump back in as one of star quarterback Tom Brady's favorite targets after pulling in 69 receptions for 1,084 yards and eight touchdowns a year ago. Gronkowski and the Patriots have reportedly made progress toward a new contract, Jeff Howe of The Athletic reports. Analysis: Be it in the form of a raise, or an extension, it looks like Gronkowski will be playing this coming season under new contract terms. Either way, he's slated to be present for the Patriots' mandatory minicamp (June 5-7), as is starting QB Tom Brady. Gronkowski said he doesn't plan to attend the optional portion of the Patriots' offseason program, Phil Perry of NBC Sports Boston reports. Gronkowski is not expected to attend the start of the Patriots' offseason program, which opens Monday, Adam Schefter of ESPN reports. The Patriots' decision to trade Brandin Cooks suggests the team is confident Gronkowski will play in 2018, Kevin Patra of NFL.com reports. Gronkowski said he's "pretty certain" he'll return to the Patriots for the 2018 season, Jeff Darlington of ESPN.com reports. Analysis: Gronkowski has been considering retirement since the end of the most recent season, but indicated he'd come back as long as Tom Brady remains with the team. The on-going drama in New England is also part of the story, as there is rumored discord between Gronkowski and head coach Bill Belichick. The Patriots are expecting Gronkowski to return for the 2018 season, though the tight end hasn't officially informed the team of his intentions, Ian Rapoport of NFL Network reports. Gronkowski (concussion) brought in nine of 15 targets for 116 yards and two touchdowns during the Patriots' 41-33 loss to the Eagles in Super Bowl LII on Sunday. Gronkowski practiced fully Thursday after clearing the NFL's concussion protocol, per Mike Reiss of ESPN.com. Analysis: When asked if he'd have any limitations while playing in Super Bowl LII, Gronkowski relayed that he's "ready to roll, full speed." In addition to Gronkowski, the other three New England players listed on the Patriots' injury report all practiced fully Thursday, setting the stage for the quartet to be available for Sunday's contest against the Eagles. Gronkowski has cleared the NFL's concussion protocol and is slated to play in Super Bowl LII, NFL.com reports. Analysis: Per the report, Gronkowski is in line to meet with the media Thursday afternoon, with the level of his practice participation (to be revealed later) of note. In any case, whether he's listed as a limited participant or a full one Thursday, the star tight end is now in line to be available for Sunday's contest. Gronkowski (concussion) practiced on a limited basis Wednesday, Nicki Jhabvala of The Denver Post reports. Gronkowski (concussion) was present at Wednesday's practice. Analysis: On Tuesday, Gronkowski expressed hope that he would come out of the other side of the concussion protocol, according to Mike Reiss of ESPN.com. In the end, an independent neurologist will make the final decision, but Gronkowski appeared to be taking part in warmups Wednesday, at the very least. His activity level will become clear once the Patriots release their first injury report of the week later in the day. Gronkowski hopes to be removed from the NFL's concussion protocol as soon as Wednesday, Mike Reiss of ESPN.com reports. Analysis: When asked Tuesday if he thought he would play in Super Bowl LII against the Eagles, Gronkowski replied, "Yes," while adding that he's feeling good at this stage of the week. In any case, the next clue regarding the tight end's playing status for Sunday should arrive no later than Wednesday, when the Patriots release their first practice participation report of the week. Gronkowski, who is still in the NFL's concussion protocol, is not expected to participate in Super Bowl Opening Night, Ian Rapoport of NFL Network reports. Gronkowski (concussion) was able to practice in limited fashion Sunday, but he remains in the league's concussion protocol, NFL Network's Omar Ruiz reports. Analysis: Gronkowski still has an entire week to be cleared and deemed available for the Patriots' Super Bowl contest against the Eagles, but for now he'll remain subject to the concussion protocol. Additional updates regarding Gronkowski's status should become available throughout the upcoming week, while fellow tight ends Dwayne Allen and Jacob Hollister figure to see increased reps during practice in the meantime. Gronkowski (concussion) returned to practice Saturday, The Houston Chronicle reports. Analysis: The team has not officially declared whether Gronkowski has cleared concussion protocol, but his presence at practice is a good indication he's progressing in a positive direction. He appears to be trending toward an active designation for the Patriots' Super Bowl matchup versus the Eagles. Expect an update on the tight end's status once the Patriots provide more information. Gronkowski (concussion) remained sidelined at practice Friday. Dianna Russini of ESPN indicated Thursday that the "overall feel" in the Patriots' locker room is that Gronkowski (concussion) will be available for the Super Bowl. Gronkowski (concussion) was not spotted at Thursday's practice, Mike Reiss of ESPN.com reports. Analysis: There figures to be a Gronkowski watch leading up to Super Bowl LII, but for now the tight end presumably remains in the NFL's concussion protocol. Working in his favor is that the Patriots don't take on the Eagles until Feb. 4, so Gronkowski does have a decent amount of time in the meantime in order to gain medical clearance to play in the big game. Gronkowski (concussion) was listed as a non-participant on Wednesday's practice report estimate. Analysis: Gronkowski has some medical hurdles in front of him in order to be cleared in advance of Super Bowl LII, which takes place Feb. 4, but the extra time between games (the tight end was concussed this past Sunday) helps his cause. There's been a degree of optimism with regard to Gronkowski's availability for the Super Bowl, but his status will still need to be monitored closely in the coming days, and we suspect that he'll ultimately be listed as questionable for the contest. The Patriots are optimistic that Gronkowski (concussion) will be cleared in advance of Super Bowl LII, which takes place on Feb. 4, the Boston Herald reports. Gronkowski has entered concussion protocol, but there's optimism the tight end will be cleared in time for the Super Bowl on Feb. 4, Karen Guregian of the Boston Herald reports. Analysis: Gronkowski absorbed a helmet-to-helmet hit in the second quarter of Sunday's AFC championship game against the Jaguars and was later ruled out for the remainder of the contest. His chances of being cleared in time are benefitted by the fact he'll have an extra week of rest with the Super Bowl still two weeks away. Gronkowski (head) has been ruled out of Sunday's AFC championship game against the Jaguars. Analysis: In the aftermath of a helmet-to-helmet hit at the end of the first half, Gronkowski was taken directly to the locker room to undergo concussion testing. He didn't join his teammates on the sideline after halftime, at which point he was deemed questionable to return. With reentry ruled out, the Patriots will likely rely on their stable of wideouts and running backs to sustain the passing game. Gronkowski (head) is questionable to return to Sunday's AFC championship game versus the Jaguars. Analysis: Gronkowski was on the receiving end of a helmet-to-helmet hit from Jaguars safety Barry Church in the latter stages of the first half. Rather than make an immediate visit to the blue sideline tent, Gronkowski went the locker room and remains under evaluation for a concussion. If Gronkowski is unable to return, the Patriots will be down to one healthy tight end in Dwayne Allen. 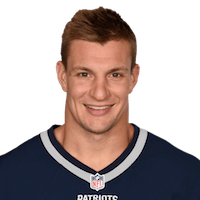 Gronkowski (head) went to the locker room in the last two minutes of the first half of Sunday's AFC championship game against the Jaguars, Ben Volin of The Boston Globe reports. Analysis: Gronkowski took a hit to the side of the head from Jags safety Barry Church on a pass attempt, a play that draw a personal foul penalty. After getting to his feet slowly, Gronkowski avoided the blue sideline tent as he was instead escorted to the locker room. A concussion check is in order, but the rigorous protocol for head injuries may make it difficult to return to action. Gronkowski turned nine targets into six catches for 81 yards and a touchdown during Saturday's 35-14 win over the Titans in the divisional round. Gronkowski did not catch any passes in Sunday's 26-6 win over the Jets. Analysis: Gronkowski saw his share of double-teams in the contest, but overall he simply wasn't a big part of the team's Week 17 game plan. More importantly, the oft-injured tight end will head into the playoffs healthy and once the Patriots resume action following their first-round bye, we'd expect Gronkowski to reclaim his significant role in the New England passing attack. Gronkowski (illness) does not carry an injury designation for Sunday's game against the Jets. Analysis: Gronkowski will be a go for this weekend's game and should see his normal share of snaps in the contest as long as the outcome is in question. With a win (or a Steelers loss) Sunday, the Patriots would clinch the AFC's No. 1 playoff seed. Gronkowski (illness) returned to practice Friday, Zack Cox of NESN.com reports. Analysis: Gronkowski sat out Thursday's practice due to an illness, but it appears that will be the extent of his absence. He is on track to suit up like he regularly does for the Patriots' Week 17 matchup with the Jets. An illness kept Gronkowski out of Thursday's practice, Zack Cox of NESN.com reports. Analysis: We'd expect the tight end to return to practice Friday in some capacity, but in any case look for Gronkowski to be a go Sunday against the Jets. With a Week 17 win, the Patriots would clinch the No. 1 playoff seed in the AFC. Gronkowski (undisclosed) was not present for the initial stages of Thursday's practice, Jeff Howe of the Boston Herald reports. Analysis: We'll circle back on the tight end's status later Thursday, but the report suggests that it's possible Gronkowski could be under the weather, or alternatively it could end up that he was able to rejoin his teammates later in the practice session. Gronkowski caught five of his seven targets for 67 yards and a TD in Sunday's 37-16 win over the Bills. Analysis: Assuming the Patriots have something to play for in Week 17, Gronkowski profiles as a top-flight fantasy option at tight end next Sunday against the Jets. Gronkowski caught nine of 13 targets for 168 yards during Sunday's 27-24 victory over the Steelers. Gronkowski (suspension) was added to the 53-man roster Wednesday, Jeff Howe of the Boston Herald reports. Gronkowski's suspension was lifted Tuesday, but the Patriots now have a roster exemption for the tight end, Jeff Howe of the Boston Herald reports. Analysis: With the exemption at their disposal, the Patriots have until Saturday to release a player in order to open up a spot on the 53-man roster. There's little doubt the team will do so, but it may want to evaluate the health of certain positional groups before making the final call. In any case, Gronkowski will return Sunday against a Steelers defense that has allowed 6.4 YPT and an NFL-low two touchdowns to tight ends this season. The NFL has upheld Gronkowski's one-game suspension, Ian Rapoport of NFL Network reports. Analysis: Gronkowski will thus miss Monday's game against the Dolphins and is eligible to return to action in Week 15 against the Steelers. Dwayne Allen is set to start at tight end for the Patriots this weekend, with Jacob Hollister on hand in a reserve role. Gronkowski has been suspended for one game as the result of his late hit on Buffalo's Tre'Davious White in Sunday's 23-3 win over the Bills, ESPN's Mike Reiss reports. Analysis: Per the report, Gronkowski will appeal his suspension, but in the meantime, those who normally rely on the Patriots' star tight end will need to look for alternate arrangements in Week 14. His backup, Dwayne Allen, is an option on that front, but there's no guarantee he'd be a big part of the New England passing game in the absence of Gronkowski next Monday against the Dolphins. Gronkowski likely will get final word on the appeal by midweek, freelance NFL reporter Jason La Canfora reports. Gronkowski may be suspended for Week 14 against the Dolphins as a result of his cheap shot on cornerback Tre'Davious White during the fourth quarter of Sunday's 23-3 victory over the Bills, ESPN.com's Kevin Seifert reports. Gronkowski brought in nine of 11 targets for 147 yards in Sunday's 23-3 win over the Bills. Gronkowski (illness) brought in five of eight targets for 82 yards and two touchdowns in Sunday's 35-17 win over the Dolphins. Gronkowski (illness) relayed Friday that he is good to go for Sunday's game against the Dolphins, Mike Reiss of ESPN.com reports. Analysis: Gronkowski, who noted that he feels fortunate that he was able to move past his illness quickly since missing practice Wednesday, is thus in line to head the Patriots' tight end corps in Week 12. As long as he continues to suit up he's a fantasy lineup lock, heading into Sunday's action with a total of 41 catches (on 67 targets) for 620 yards and five TDs over the course of nine outings this season. Gronkowski (illness) returned to a limited practice Thursday, the Boston Herald reports. Analysis: Gronkowski is in little danger of missing Sunday's game against the Dolphins, a notion that would be solidified Friday in the event that the Patriots do not assign their star tight end an official Week 12 injury designation for the contest. Gronkowski missed Wednesday's practice due to an illness. Analysis: Gronkowski's lengthy injury history made his absence from practice Wednesday notable, but the clarification that he's not banged up and instead is under the weather should ease concerns about his availability for the Week 12 matchup with the Dolphins. Unless the illness is more of a concern than the Patriots are willing to admit, look for the tight end to resume practicing Thursday or Friday. Gronkowski (undisclosed) wasn't present for Wednesday's practice, the Mark Daniels of The Providence Journal reports. Analysis: Gronkowski was on the field for 88 percent of the Patriots' offensive snaps in the Week 11 win over the Raiders, and with no injury setbacks having been reported since then, it's quite possible that the star tight end's absence Wednesday is maintenance-related. Gronkowski caught all three passes directed his way for 36 yards in Sunday's 33-8 defeat of the Raiders. Analysis: Despite the Raiders being a good matchup for tight ends, Gronkowski was not a major part of the game plan and simply wasn't targeted after the Patriots got up 24-0 early in the third quarter. The Patriots' other tight ends, Dwayne Allen and Martellus Bennett, totaled five targets in the contest, with three of them coming in the second half. Gronk will look to get back to his dominant ways in Week 12 against Miami. Gronkowski logged 61 out of a possible 70 snaps on offense in Sunday's 41-16 win over the Broncos, ESPN's Mike Reiss reports. Gronkowski caught four of seven targets for 74 yards during Sunday's 41-16 victory over the Broncos. NFL Network analysts debate when the New England Patriots should replace tight end Rob Gronkowski in the 2019 draft. NFL Network's Peter Schrager thinks New England Patriots tight end Rob Gronkowski is the greatest tight end to ever play the game. NFL Network's Mike Giardi and Peter Schrager discuss the retirement of New England Patriots tight end Rob Gronkowski. 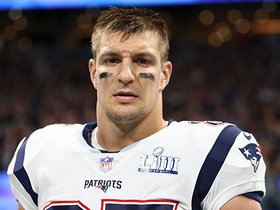 NFL Network's Mike Giardi reports New England Patriots tight end quarterback Rob Gronkowski hasn't made retirement decision yet. 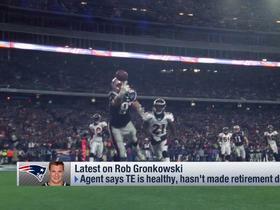 NFL Network's Mike Garafolo and Tom Pelissero talk about New England Patriots tight end Rob Gronkowski's timetable of when he will make a retirement decision. Watch New England Patriots tight end Rob Gronkowksi and running back Sony Michel team up for the game's only TD in Super Bowl LIII.